Watercolour; 'Paritutu Beach' by J C Richmond. Image is of Paritutu Rock, New Plymouth, with a boat in distance, and hills in the foreground. The painting is glazed and mounted, and enclosed in an ornate black wooden frame. Dated 1866. James Crowe Richmond arrived in New Zealand, with his younger brother Henry, on board the 'Victory' in 1851. The two followed an aunt, Helen Hursthouse (née Wilson), who had settled in Taranaki, and were relatives of William and Emily Richmond who owned Richmond Cottage, now in central New Plymouth. Trained as an engineer, James Crowe Richmond was also a talented artist (he had spent a brief period at Leigh's drawing academy in London). 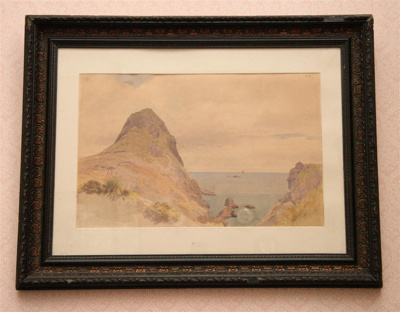 He painted romantic landscapes in watercolour, such as this one of Paritutu beach. His house, known as 'The Palace of Art', and Harry's 'Hurworth' were the only two houses of the larger settlement of Hurworth to survive attack during the New Zealand Wars. Sadly, it was accidently burnt down in 1865.